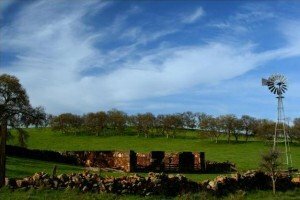 As you drive eastbound on Highway 4, keep your eyes peeled for some curious structures dotting the hills of western Calaveras County. Beginning a few miles east of Stockton as you approach Copperopolis, you may happen to catch a glance of the old stone walls winding their way through the terrain. Who built them? And what was their purpose? It’s funny how legend take a fanciful turn into more fictional tales. Many natives will tell you it was Chinese laborers who built the stone walls back in the 1850s. Sounds fair enough. After a bit more digging, however, the real story starts to emerge. In the 1850s, copper was discovered in western Calaveras County. A town quickly emerged at the spot — initially dubbed Grasshopper City until a telegraph was built there a few years later — and soon the area was bustling with activity. Hundreds of immigrant workers flooded Calaveras with copper-mining ambitions. Over the years, however, copper was discovered in other areas — and with more abundance — and the town of Telegraph City dwindled in population, becoming more of a ranching site than a hopping township. The ranchers there made a new (and arguably less exciting) discovery in Telegraph City: field rock. It was plentiful and, therefore, dirt-cheap (pun intended). The ranchers hired immigrant workers still in the area — mainly Irish and Italian — to build rock walls on their properties to serve as fire deterrents as well as a means to confine their livestock. These days, the rock walls have deteriorated and Telegraph City is little more than a ghost town, complete with its own “Legend of the Chicken Boy” — a legend to be a detailed in a special and appropriately spooky Halloween post. So the next time you’re on your way back to Murphys, keep an eye out for Telegraph City and its old stone walls. Their a fascinating curiosity and certainly a nice piece Calaveras history.